Red neon signage down the end of a dumpster-lined laneway is about as Asian as it gets at Lee Ho Fook, a contemporary Chinese diner that’s the latest to join the throng of eateries lining Melbourne’s Flinders Lane. A narrow site occupying both floors of a late 19th century brick warehouse, Fook is the latest venture from Peter Bartholomew and David Mackintosh – the astute backers behind some of the most famous chefs in town. 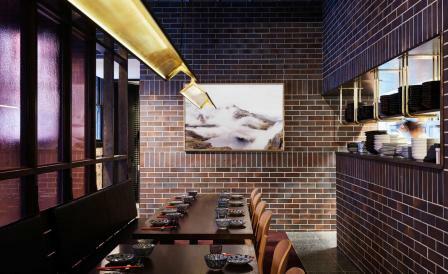 In the kitchen, partner and head chef Victor Liong creates Chinese cuisine that’s refined (raw kingfish with with radish, burnt garlic and ginger) and rich (Xinjiang lamb shoulder with fragrant chill) in equal and complementary measures. Mirroring Liong’s non-traditional approach, local practice Techné also shies away from Chinese pastiche and cliché. Capitalising on an attractive bones of red brick, timber floors and attic ceilings, the handsome dining rooms benefit from restrained touches of ornamentation in the from of custom brass light fixtures, landscape photographic prints and Chinese porcelain table settings. No red, no plastic gold, no lanterns and no waving cats in sight.